The Cursive Writing Program is a 140-lesson program that not only teaches students to write in cursive, but how to write faster and more accurately. Easy to teach lessons include concise instructional plans, and simplified manuscripts make cursive writing easy and almost effortless to learn. 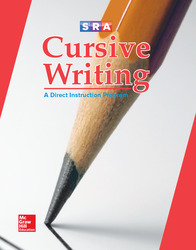 The Cursive Writing Program's model and practice strategies emphasize showing rather than telling, and the program's teacher-directed lessons and teaching principles make classroom instruction effective.